Last month, we reported that Starz's hit series Ash Vs. Evil Dead will kick off with its Season 2 premiere on Sunday, October 2. The show's original Comic-Con trailer was actually banned from the convention for being too gory, with rapper, actor and huge Evil Dead fan Kid Cudi debuting the footage through social media. While we get closer and closer to the premiere, Starz has unveiled yet another preview, which ups the gore, shocks and scares in these new episodes. 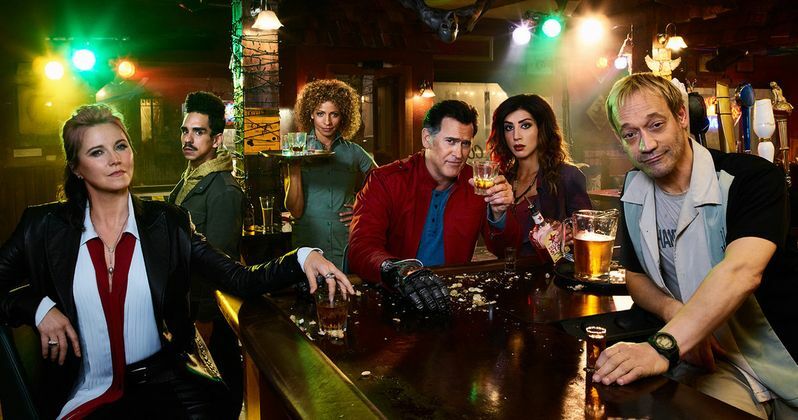 Earlier this year, Starz debuted a first look photo from Season 2, featuring Ash Williams (Bruce Campbell) using his chainsaw hand to "open" a keg of beer. This new preview offers more footage from Ash's epic party in his hometown of Jacksonville, Florida, which gets interrupted when his partners Kelly (Dana DeLorenzo) and Pablo (Ray Santiago) come to town, as Ash is beckoned back to his hometown of Elk Grove. We also learn from Ted Raimi why Ash Williams hasn't come home in all these years, and we also get a new look at Lee Majors as Ash's father. Ash vs Evil Dead scares up its second season premiere entitled "Home" on Sunday, October 2 at 8PM ET/PT on Starz. The second season roars back into action with an extended episode where Ash is forced to leave his cushy retirement in Jacksonville, return to his hometown of Elk Grove, Michigan, and mount up once again to face The Evil Dead. This time, he'll have to form an uneasy alliance with his former enemy Ruby as Elk Grove becomes the nucleus to the most dangerous horror Ash has faced to date. The upcoming season of Ash vs Evil Dead will include ten half-hour episodes. The cast is led by Bruce Campbell (Evil Dead, Burn Notice) in the role of Ash Williams, Lucy Lawless (Salem, Spartacus) as Ruby, who now possesses the powerful Necronomicon, Ray Santiago (Touch, Meet the Fockers) as Pablo Simon Bolivar, Ash's loyal sidekick dealing with the trauma he suffered in the cabin; and Dana DeLorenzo (A Very Harold & Kumar 3D Christmas) as Kelly Maxwell, who, grief-stricken after the death of her parents, plots revenge against The Evil Dead. Lee Majors (Do You Believe), Ted Raimi (Xena: Warrior Princess, Spider-Man) and Michelle Hurd (Law & Order: SVU) join the cast this year as Brock Williams, Ash's father, Chet Kaminski, Ash's childhood best friend, and Linda, Ash's high school love respectively. We also reported earlier this month that there will be a new villain in Season 2, Baal, played by Josh Tobeck. Sam Raimi serves as Executive Producer of Ash Vs. Evil Dead with Rob Tapert (Evil Dead, Spartacus, Xena: Warrior Princess), Bruce Campbell (Evil Dead}, Burn Notice) and Ivan Raimi (Drag Me To Hell, Spider-Man 3) along with Craig DiGregorio (Workaholics, Chuck) who serves as Executive Producer/Showrunner. Aaron Lam (Spartacus) and Moira Grant (Spartacus) serve as Producers. Take a look at this new preview to get ready for Ash vs. Evil Dead Season 2.